Cat Winters: The Massive Six-Months-Until-2013 Book Giveaway! The Massive Six-Months-Until-2013 Book Giveaway! The year 2013 is now only six months away, so we debut 2013 authors at The Lucky 13s are celebrating with a major giveaway. Each of us will be mailing the winner a copy of a novel that influenced our writing, as well as swag for own books. To enter the giveaway, head over to thelucky13s.blogspot.com by July 7. I'm having to auto-post this message because I'm taking off on vacation July 1, so I'm unable to include the direct link. You may have to scroll down to the July 1 post at The Lucky 13s site if you're visiting on a later date. I picked The Book Thief as my giveaway novel because of Zusak's ridiculously skilled use of language and brilliant talent for developing characters. He challenged me to make my own writing better. Furthermore, his ability to weave the horrors of history with a fictional tale told by an otherworldly narrator (Death) was a huge inspiration to me. In my own novel, I'm blending the unsettling realities of 1918 America with paranormal nightmares and a ghost. I hope, like Zusak, I've grounded my story in enough human emotions you can feel in your gut to make the fantastical side of the tale believable. Good luck to everyone who enters the giveaway, and keep in mind I won't be responding to comments and emails until after July 9 due to my trip. 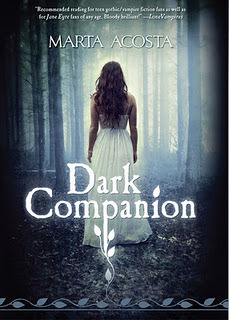 Also, be sure to check out Marta Acosta's Gothic YA debut this week: Dark Companion, available from Tor Books July 3. Marta has been a supportive cheerleader for my own writing during the past few years, and I'm thrilled the world is getting a chance to read her Jane Eyre-influenced tale. THE BOOK THIEF is one of my favorites! Good choice! It's an excellent book, isn't it? I did have a wonderful vacation, but now I'm tired and jet lagged. We had a great but exhausting time in hot and muggy Ohio.